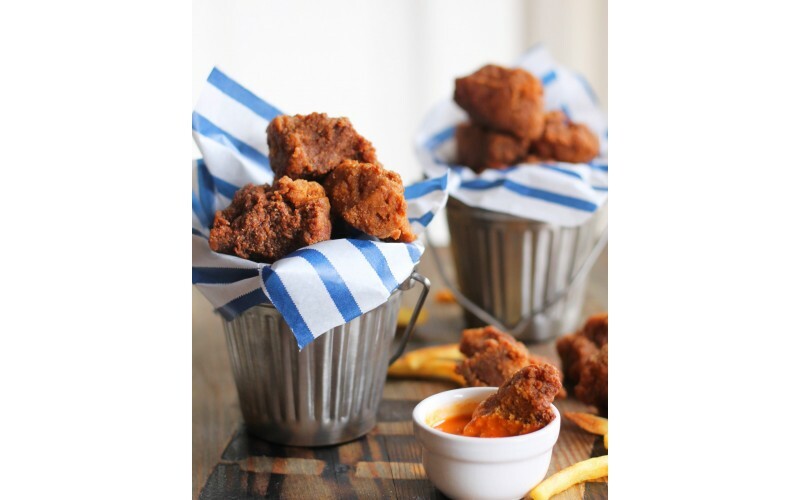 Seitan - or gluten - is the original meat alternative. This tasty dish originated in China hundreds if not thousands of years ago as a food for vegetarian Buddhist monks. It has since percolated round the Far East, eg Japan and Vietnam and is now used widely in contemporary Western veggie and vegan food. High in protein, low in fat, and dense in texture, it lends itself to all sorts of dishes, including stir fries, 'steaks', deli slices for sandwiches, meat balls/chunks and more. While it is an excellent source of protein, it is pure gluten so best not eaten more than once a week - it's always good to include as wide a variety of foods as possible, eg pulses, tofu, nuts, wholegrains, vegetables, fruit and the like. Obviously, seitan is unsuitable for the gluten or wheat intolerant. Ready-prepared gluten flour (also known as vital gluten or vital wheat gluten flour) is available from some health food shops or else online from stores such as BuyWholefoodsOnline; Veggie Stuff and Realfoods (who sell an organic version). Ebay also carries a range of prices and brands! Engevita nutritional yeast flakes are available from Holland & Barrett, independent health food shops and Ocado or the above sites. We've also seen both products on Amazon! As you'll see, it's worth shopping around to get the best deal. It can be a very economical dish to make. Do I need to make so much?! No - this recipe is easily halved or even quartered. But remember, it freezes well so if you've got the space it's a brilliant core ingredient for many recipes. Combine the first three ingredients in a large mixing bowl. In a small bowl, mix the puree, oil, soya sauce and garlic. Add this to the dry ingredients then gradually mix in the stock about a cup at a time with a wooden spoon or spatula. Start to mix everything together with your hands so all the dry bits round the edge of the bowl are incorporated into the ball of dough. Continue adding the liquid until everything is integrated and a thick dough has formed. Knead the dough for 3-5 minutes or until the dough is elastic and easy to handle. Now form it into 6 large chunks. Pour the extra stock and soya sauce into a large saucepan with a lid and then place the seitan pieces in carefully. Bring to the boil then reduce to a simmer/rolling boil. Cook them for 30 minutes. Turn them over and repeat for another 20 minutes. Make sure the seitan is covered with liquid at all times. Taste to see that the stock is strong enough - you can always add a dash or so of soya sauce but remember that the seitan can be seasoned in cooking so you don't want it too salty. Remove seitan from heat, and let it cool in the stock. When it is cool, divide it into bit-sized chunks and set aside. Heat a medium saucepan half full of vegetable oil on med-high heat or use a deep fat fryer. If you have light, powdery breadcrumbs then you might be able to stick them to the seitan chunks without any extra water or flour/water paste. If they aren’t sticking then brush a bit of water onto the seitan and dip them in the breadcrumbs. If your breadcrumbs are heavier/bulkier or the powdery ones aren’t sticking then mix the water and the flour together to form a paste. Dip each piece of seitan into the flour/water paste then into the breadcrumbs. Lower a few pieces of the ‘chicken’ into the hot oil at one time and fry until golden and crispy.